​Most reasonable ​Eagles fans want ​Golden Tate back in their receiving corps for the 2019 NFL season, but Philadelphia management might not feel the same way. 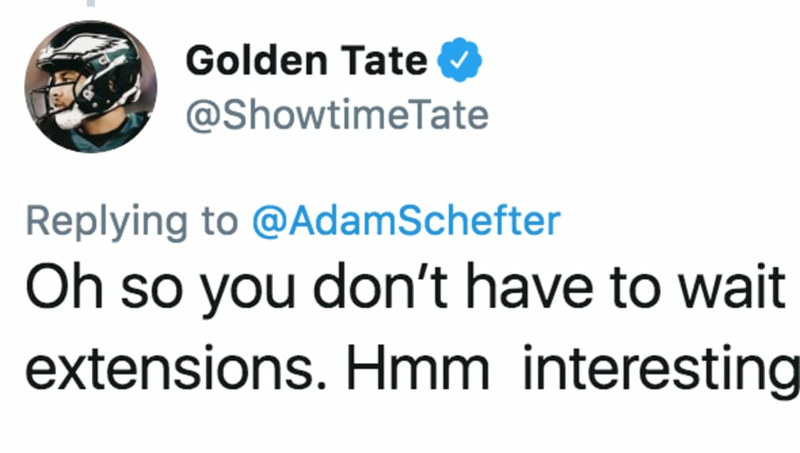 At least, according to Tate's most recent cryptic tweet in response to Adam Schefter, the two sides have a ways to go early in the offseason should they hope to agree to an extension. The shade is real. Tate just finished out the final year of his deal after being traded to Philly from the Detroit Lions at the deadline. Tate made a sustained impact with the Eagles, but he's expected to receive a contract which might be a little over Philadelphia's price range. This explains the lack of an open dialogue thus far between the two sides. Tate is unlikely to take a hometown discount with the Eagles, as he spent less than half a season in the City of Brotherly Love. If Howie Roseman and Co. don't pony up, they'll lose the 30-year-old for good. Give Tate credit. While this seems like a petty move from the outset, he's just trying to get the front office's attention.